“You want our blood, but you don’t want our pain,” is how Whitney Houston assessed the public’s interest in superstars in a 1991 interview with Ebony. This was years before her problems with drugs were common knowledge, and decades before her 2012 death from drowning (in which cocaine, per the Los Angeles County coroner’s report, was a contributing factor). Kevin Macdonald’s new, estate-authorized documentary, Whitney, honors Houston’s talent and aforementioned gripe, though not in equal measure. The film contains a staggering amount of pain—it’s almost unrelenting in the last hour. I left the theater rattled. I won’t go as far as to say it left a bad taste in my mouth, as I don’t believe the creative decisions behind such a bleak portrait were made in bad faith, but as a nearly lifelong fan of Houston, I’ve never had a less enjoyable time thinking about her than I did for the two hours I spent screening this film. Macdonald’s doc is thorough—he interviewed more than 70 subjects, many of them close friends and family of Houston. But anyone who followed Houston’s career closely throughout its duration will spot that it’s also incomplete, and too often what’s left out is in service of sketching a rather simplistic trajectory of Houston’s career that has the shape of a child’s drawing of a mountain: there’s her shot up to fame and then an equally steep crash. It made me wish Macdonald had a longer running time or perhaps the docuseries format to really explore the nuances of Houston’s career. as a nearly lifelong fan of Houston, I’ve never had a less enjoyable time thinking about her than I did for the two hours I spent screening this film. That interview has been quoted throughout the years to illustrate what a mess Houston was, but that’s only part of the story. The other part is: she was right. Why on earth would a multimillionaire ever smoke crack when she could buy (and end up, as implied in the documentary, spending a vast amount of her fortune on) the finest cocaine? That’s the thing about Houston. There was a clarity about her even through the haze. Being Bobby Brown was as much about addiction as it was about letting go, particularly of fame. By the time that show was filmed in the mid-’00s, Houston was so tired of her celebrity that she was filmed telling autograph-seeking fans to go away and leave her alone. “I think what we’ve got to understand that Whitney’s reputation was so tarnished that in a way, the only way was up,” said Macdonald, who admitted he was reluctant when Houston’s former film agent and eventual Whitney executive producer Nile David approached him. “The worst I could do was keep her reputation where it was, but by humanizing her, which is what I wanted to do, you understand someone, you feel for them more, and you forgive them, and you feel more compassion for them.” Prior to working on this movie, Macdonald (who directed The Last King of Scotland, the 2012 Bob Marley doc Marley, and won an Oscar for 1999's One Day in September) was no kind of Whitney stan—he told me that if he liked Houston’s music at all during her heyday, he would have been embarrassed to admit it. What wasn’t corrected by obits and reminiscing was the rather blunt idea that the second half of Houston’s career was a nonstop disaster—an idea reified by Whitney. I wonder how accurate his assessment of Houston’s reputation was, though. Hadn’t Houston’s death forced a public reevaluation of her life? When she died decades after her prime, didn’t a nation mourn just as hard as it would have if she’d died while she was still in perfect voice, still cranking out chart-topping hits? Maybe I saw things as I wanted while grieving her death (I’ve never been more affected by a celebrity’s passing; I simply adored Whitney through it all), but it seems to me that the narrative Macdonald and the estate that commissioned him were seeking to correct had largely been corrected. Whitney Houston’s death largely sobered up those who thought she was a joke. What wasn’t corrected by obits and reminiscing was the rather blunt idea that the second half of Houston’s career was a nonstop disaster—an idea reified by Whitney. The last 15 years of Houston’s life were fraught, but not without their triumphs. There was her solid 1998 album, My Love Is Your Love, which is virtually glossed over in the doc (though a few seconds of the title hit plays), and then her well-received 2009 album, I Look to You, which goes unmentioned. It yielded a disastrous tour, which the doc includes, but also truly poignant moments in which Houston’s voice could be viewed not as a tragically damaged instrument, but as a document of the hardship she’d faced. Transferring one’s life so unmistakably to song is the essence of soul. Never, I believe, did Houston do that more movingly than when she performed “I Didn’t Know My Own Strength” on Oprah in 1999, another moment left out of Whitney. Though Whitney is crammed with Houston’s music, not much time is spent on her actually process or relationship to it, aside from some footage shot in recording studios and some other of her arranging backup singers during tour rehearsals. Her ascent to pop superstardom is told in rapid-cut montage, and the section of the film about her rendition of “The Star Spangled Banner” at the 1991 Super Bowl, inspired by Cinque Henderson’s New Yorker piece on the subject, is more focused on the rearrangement of the song by Houston’s former musical director, Rickey Minor, than Houston’s contribution. “Her creative process wasn’t generally that interesting,” said Macdonald. “Because she was kind of a genius, she would just show up and do it like she did with ‘The Star Spangled Banner.’” If magic were explicable, it wouldn’t be magic, and Whitney Houston at her best, was pure magic. But it is nonetheless frustrating that so little time is spent on interrogating Houston’s gift in Whitney. Did she like her own songs? When her music transitioned into more rhythmically inclined, decidedly R&B territory starting with I’m Your Baby Tonight (supposedly in direct response to criticism that her early work was too white-sounding), was she happier? At the very least, a deep dive into her creative process might help elucidate Houston’s apathy toward making music during (at least) the last 10 years of her life. Did singing come so naturally to her that she took it for granted, in the same way she came to regard fame? I’ve long held that Whitney Houston’s eventual disillusionment with being one of the most popular, talented humans on the planet is proof that people can get used to anything if it sticks with them long enough. “Leaving that in there is indicating to the audience how difficult it must have been for Robyn and Whitney at that time for them to be together in the face of that kind of disapproval,” said Macdonald, adding that Gary Houston’s resentment also stems from the considerable amount of sway Crawford had over Houston. Macdonald, by the way, is convinced that the rumors of a Houston-Crawford romance were true via his research. He declined to specify what exactly these were beyond “documents and letters and things.” He also said that, contrary to popular belief, Houston and Crawford broke up “fairly early” in Houston’s career but remained close for years after. Perhaps we’ll get further clarification on this soon—the press notes for Whitney state that Crawford, who after months of negotiations declined to be interviewed for the doc, is working on a book. In its attempt to clarify while often taking an authoritative tone, Whitney often merely provokes more questions than providing definitive answers. The analysis, though, is largely handled by Jones, who while close to Houston, does not seem to have any credentials of expertise in child development. When she says the abuse made Houston question “her sexual preference and I think that’s why she really wanted a family—a husband, children—to make her feel that this is what’s supposed to happen,” it sounds plausible and is presented as fact when it should really be taken with a grain of salt, since we’re not hearing it from Houston directly. The same goes for musical director Rickey Minor’s assertion that Houston was sexually “fluid” during the segment of the film concerning her relationship with Crawford. Was she? Did she identify that way, or are we retrospectively drawing conclusions based on one relationship? In its attempt to clarify while often taking an authoritative tone, Whitney often merely provokes more questions than providing definitive answers. There’s also the frankly bizarre decision to portray events of Houston’s life out of order—we see the birth of Bobbi-Kristina Brown, then the section on “The Star Spangled Banner,” and then The Bodyguard. Bobbi-Kristina was born after the release of The Bodyguard (Houston was visibly pregnant with her daughter in the “I’m Every Woman” video). Asking Macdonald about this decision yielded little clarity. The subjective nature of such decisions should remind us of the scarcity of the definitive document—necessarily omitted for time and other reasons are details and whole untold sides of various stories. Whitney is one way to tell the story of Houston’s life; last year’s Nick Broomfield/Rudi Dolezal doc, Can I Be Me, which I think got at some complicated nuances of Houston’s late career much better than Whitney does, is yet another. Houston’s story is so unbelievable, her talent so unfathomable that she left behind a trove of material to be dissected. That process certainly should not stop here, with Whitney. 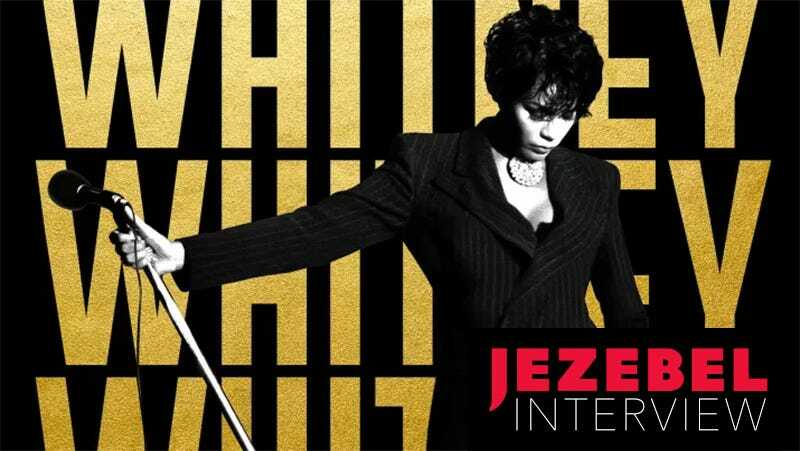 Whitney is in theaters today, July 6.